The blue coua (Coua caerulea) is a species of bird in the cuckoo family; It is a non-parasitic member of the cuckoo bird family. The blue couas are also called as Madagascar coucal. They renowned for their striking deep blue plumage. 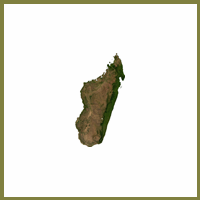 It is endemic to Madagascar. The bird is a deep blue with a bare blue oval around the eye and beak. It averages a size of 48–50 cm in length and 225–268 g in weight, with females slightly larger. Unlike other cuckoo birds, the blue couas build their own nests. They use the leaves and twigs to build their nest. The nests of blue couas usually remain hidden in the trees of bushes. They only lay one egg during the breeding season. Interestingly, blue couas also incubates their own eggs. The panther chameleon (Furcifer pardalis) is a species of chameleon found in the eastern and northern parts of Madagascar in a tropical forest biome. They measure 17-20 inches in length. With a size of a house cat, the panther chameleon is among the largest chameleons in the world. The panther chameleons are also famous for their striking technicolor skin. The color pattern of their skin varies with the location they live in. The skin color ranges from orange, red, blue, dark green or blue-green with different stripes and spots. The male panther chameleons are more colorful than the females. They have the power to change their color with incredible speed. This spectacular color changing doesn’t merely depend on the change of location. It is also affected by their state of emotion, health, temperature variation, and light intensity. The male panther chameleons display such an amazing skin color transformation during breeding season or on defense. The female chameleons usually become pale or orange to pink in color breeding season. Tomato frogs named after their vibrant orange-red colored skin. Only the female frogs have such a brilliant tomato like coloration. The male frogs have a duller brownish-orange color. Undoubtedly, tomato frogs are one of most colorful animals in the world. They only found in the forests of Madagascar Island. The brilliant coloration of tomato frogs is actually a warning to their predators. But tomato frogs are not so toxic. When threatened, their skin produces a thick, sticky fluid to deter the potential predators such as snakes. The tomato frogs are ambush predators. That means, they sit in a particular spot and will make a surprise attack on their preys. The diet of tomato frogs mainly includes insects and small invertebrates. The lifespan of the tomato frog can be from 6 to 8 years. The fossa is a cat-like, carnivorous mammal endemic to Madagascar. It is a member of the Eupleridae, a family of carnivorous closely related to the mongoose family. Fossa is the largest carnivore found only in the forest of Madagascar. This mammal can reach 6 feet in length and weigh up to 10 kg; they live up to 20 years. The fossas have very strong, muscular body with short reddish-brown coat. The long tail is one of the most distinguishing features of fossas. Fossas are very agile climbers. The retractable claws and flexible ankle joints allow them to easily climb up on the trees. fossa is the most efficient hunter among the Madagascar animals. It is an ambush predator, make surprise attack on its preys. With the sharp claws and sharp tooth, fossas can quickly kill their prey. Lemurs are the main food of fossas. They also hunt on other small mammals, fishes, birds, frogs and lizards. The satanic leaf tailed gecko endemic to Madagascar is a master of camouflage. This amazing lizard can unbelievably camouflaged to resemble a dead leaf. Nobody can easily spot the leaf-tailed gecko when it’s resting over the leaf. This unique species of Madagascar can perfectly blend into its natural surroundings. The satanic leaf-tailed gecko only has a length between 10-15 cm. The coloration of leaf-tailed gecko is amazingly varied, ranges from grey, brown, tan, yellow and orange. They also have leaf-vein like lines on their body. So that the leaf-tailed gecko can easily mimic a dead leaf. The satanic leaf-tailed geckos are nocturnal reptiles. Thus, the satanic leaf-tailed geckos can avoid the threat from potential predators like birds and snakes. The camouflage is not the only technique used by the satanic leaf-tailed geckos to avoid the threat. Thus, the satanic leaf-tailed geckos can confuse the predator and can escape from its sight. The aye-aye (Daubentonia madagascariensis) is a lemur, a strepsirrhine primate native to Madagascar that combines rodent-like teeth that perpetually grow and a special thin middle finger. Aye-aye is the largest nocturnal primate in the world. They are dark-brown in color and have large eyes and slender fingers. All these make aye-aye looks so scary. Although, they are very gentle and harmless. But many people kill them on sight because of their scary appearance. Such hunting and habitat loss make aye-aye as one of the endangered animals of Madagascar. Aye-aye is a nocturnal creature and hunt only at night. During day hours, they sleep on the sphere like nest build on the tree branches. At night, they travel for more than 4 km in searching for food. Aye-aye uses its large, sensitive ears to detect the wood-boring larvae and take them out with their elongated middle finger. Aye-aye inhabits in the coastal forest of Madagascar. 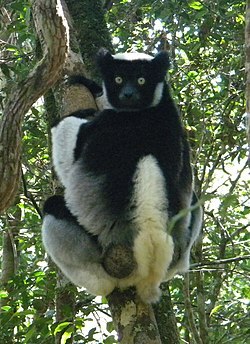 The indri also called the babakoto, is a primate. It is one of the largest living lemurs with a head-and-body length of about 64–72 cm (25–28 in) and weight of between 6 to 9.5 kg (13 to 21 lb). It has a black and white coat and maintains an upright posture when climbing or clinging. It is monogamous and lives in small family groups, moving through the canopy feeding; mainly on leaves but also seeds, fruits, and flowers. The groups are quite vocal, communicating with other groups by singing, roaring and other vocalisations. It is a diurnal tree-dweller related to the sifakas and, like all lemurs, it is native to Madagascar. The main threats faced by the indri are habitat destruction and fragmentation due to slash and burn agriculture, fuelwood gathering, and logging. It is also hunted despite taboos against this, and the International Union for Conservation of Nature has rated its conservation status as "critically endangered". Sifakas are a genus (Propithecus) of lemur from the family Indriidae within the order Primates. They are found only on the island of Madagascar. All species of sifakas are threatened, ranging from vulnerable to critically endangered. Sifakas are medium-sized indrids with a head and body length of 40 to 55 centimetres and a weight of 3 to 6 kilograms. Their tail is just as long as their body, which differentiates them from the Indri. Their fur is long and silky, with coloration varying by species from yellowish-white to black brown. The round, hairless face is always black. Sifakas move by vertical clinging and leaping, meaning they maintain an upright position leaping from tree trunk to tree trunk and moving along branches. They are skillful climbers and powerful jumpers, able to make leaps of up to 10 m from one tree to the next. Sifakas are herbivores, eating leaves, flowers and fruits. The Madagascar pochard (Aythya innotata; Malagasy: Fotsy maso, Onjo) is an extremely rare diving duck of the genus Aythya. Thought to be extinct in the late 1990s, specimens of the species were rediscovered at Lake Matsaborimena in Madagascar in 2006. As of March 2013, the population is around 80 individuals. They are endemic to the marshes and freshwater lakes of Madagascar. The initial declination in the population of Pochard duck is caused by the loss of nesting sites and by the introduction of new species to their habitat. The International Union for Conservation of Nature and Natural Resources (IUCN) classified the Pochard duck as a critically endangered bird. Madagascar Pochard is a medium sized duck, which, grows to 45-54 cm in length. They have attractive reddish-brown flanks, white belly and greyish beak. Pochard ducks have originally lived in the marshes and densely vegetated lakes of Madagascar. Today, the small remaining population of Pochard ducks faces the scarcity of food. Without proper rescue plans, they will soon disappear from this world. Giraffe weevil (Trachelophorus giraffa) is a weevil endemic to Madagascar. It derives its name from an extended neck much like that of the common giraffe. The giraffe weevil is sexually dimorphic, with the neck of the male typically being 2 to 3 times the length of that of the female. Most of the body is black with distinctive red elytra covering the flying wings. The total body length of the males is just under an inch (2.5 cm), among the longest for any Attelabid species. The extended neck is an adaptation that assists in nest building and fighting. At present, a large population of giraffe weevils lives in the forests of Madagascar. They spent most of their lives on small trees known as ‘giraffe beetle trees’. They also feed on leaves of these trees.